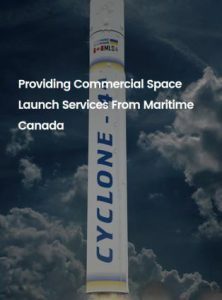 United PARADYNE Corporation has participated with two other firms to form Maritime Launch Services Ltd (MLS), a Canadian company based in Halifax, Nova Scotia. MLS was created to provide aerospace commercial launch site development and services for the Cyclone-4M rocket. The Cyclone-4M is a medium class launch system designed to support the rapidly expanding market of small satellites in low earth orbit. Cyclone 4M represents a modified version of the original Cyclone 4 vehicle, moving from a launcher purely fueled by toxic hypergolic propellants to a more environmentally-friendly version with a large first stage using Kerosene and Liquid Oxygen, restricting the use of self-igniting hypergolics to the launcher’s second stage. Cyclone 4M will be able to lift 3,350 Kilograms into a Sun Synchronous Orbit and around five metric tons into Low Earth Orbit. It is anticipated that the first launch site will be built in Canso, Nova Scotia, Canada. The proposed space center will include three major facilities 1) a launch pad, 2) a Horizontal Integration Facility and 3) a launch control center. These facilities will be separated by a distance of around two kilometers. The construction at the spaceport is promised to commence as early as 2018. According to the company, commercial launches from the spaceport could begin as early as 2019 or 2020 and by 2022, could fly up to eight missions per year. For more information please visit: http://maritimelaunch.com.